have you discovered Not On The Highstreet yet? If not you're missing out on thousands of gorgeous products that aren't available to buy elsewhere. Most come from small local suppliers who then use the larger platform to promote their designs. They have an entire weddings section dedicated to gorgeous and original wedding gifts, decorations and everything else from flowers to cake and accessories. Many of the items can be personalised to add that special touch to your big day. Here's a look at some of the huge range of products on offer. These vintage rose cake pops by The Cake Pop Company are so pretty and would make gorgeous favours at a vintage wedding. How about personalised chocolate bar wrappers from Gifts by Lucy. They are designed to fit around miniature bar of Green and Blacks, which you can buy yourself. These wooden letter by Jonny's Sister are a fantastic way to personalise and decorate your venue. They come in three sizes up to 75cm tall and can be painted to exactly match your theme. If you get distracted drooling at the products while planning your wedding, you can also arrange your wedding gift list via the site to get the choice from all of the gorgeous gifts and homeware available. 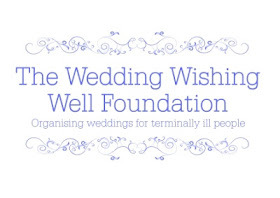 Visit Not On The Highstreet here to see more wedding items and gift ideas.